Are we living in the times spoken of by many visionaries from the past? "Before the comet comes (Nibiru/Planet X? ), many nations, will be scourged by want and famine. The great nation in the ocean that is inhabited by people of different tribes and descent (USA?) will be devastated by an earthquake(s), storm(s) and tidal wave(s). It will be divided (New Madrid Fault?) and, in great part, submerged... The comet will by its tremendous pressure force much of the ocean and flood many countries, causing much want and many plagues. All coastal cities will live in fear, and many of them will be destroyed by tidal waves, and most living creatures will be killed, and even those who escape will die from horrible diseases. For in none of those cities does a person live according to the Laws of God." St. Nilus must be counted as one of the leading ascetic writers of the fifth century. His feast is kept on November 12th in the Byzantine Calendar; he is commemorated also in the Roman Martyrology on the same date. St. Nilus probably died around 430 as there is no evidence of his life after that. "After 1900, toward the middle of the 20th century, the people of that time will become unrecognizable. When the time for the Advent of the Antichrist approaches, people's minds will grow cloudy from carnal passions, and dishonor and lawlessness will grow stronger. Then the world will become unrecognizable. homosexuality secret deeds and murder will rule in society." Holy Baptism, and equally of remorse." "The Churches of God will be deprived of God-fearing and pious pastors, and woe to the Christians remaining in the world at that time; many will completely lose their Faith because they will lack the opportunity of seeing the light of knowledge from anyone at all. "When the great time will come, in which mankind will face its last, hard trial, it will be foreshadowed by striking changes in nature. The alteration between cold and heat will become more intensive, storms will have more catastrophic effects, earthquakes will destroy great regions, and the seas will overflow many lowlands. Not all of it will be the result of natural causes, but mankind will penetrate into the bowels of the earth and will reach into the clouds, gambling with its own existence. Before the powers of destruction will succeed in their design, the universe will be thrown into disorder, and the age of iron will plunge into nothingness. When nights will be filled with more intensive cold and days with heat, a new life will begin in nature. The heat means radiation from the earth, the cold the waning light of the sun. Only a few years more and you will become aware that sunlight has grown perceptibly weaker. When even your artificial light will cease to give service, the great event in the heavens will be near." Mother Shipton lived in the time of Henry VIII of England and predicted his victory over France in 1513 in the Battle of the Spurs. 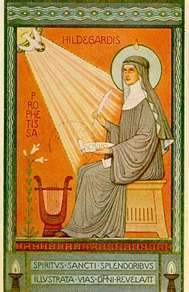 She also predicted the Dissolution of the Monasteries. This led to the redistribution of the wealth and land previously held by the Catholic monasteries to the emerging Protestant middle class and the newly formed Protestant noble families. It is recorded in the diaries of Samuel Pepys that whilst surveying the damage to London caused by the Great Fire, in the company of the Royal Family, they were heard to discuss Mother Shipton's prophecy of the event. when boats like fishes swim beneath the sea. When men like birds shall scour the sky. Then half the world, deep drenched in blood shall die." six times before the earth shall die. for the six heralds in this prophecy." 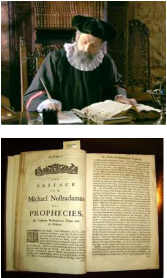 Michel de Nostradamus (Michel de Nostredame or Michael of Our Lady) was born on the 14th December 1503 in the south of France where he studied the humanities. He obtained his doctorate in philosophy and medicine at the age of twenty-six. Later he was appointed adviser and personal physician to the Kings of France, a post he retained through the reigns of Henry ll, Francis ll, and Charles lX. He was a member of the Third Order of St. Francis, and was a devout Catholic all his life. He died on the 2nd July 1566 (63 years old). * This biography is given because many well intentioned people consider him to be"New Age" or even an occultist. The famous Catholic author, Yves DuPont, says he considers Nostradamus to be an authentic seer. Nostradamus, was a French astronomer, medical doctor, apothecary and reputed seer who published collections of prophecies that have since become renowned and famous worldwide. He is best known for his book Les Propheties (The Prophecies) which first appeared in 1555 and which has rarely been out of print since his death. It should be noted that Nostradamus lived around the time of St. Joan of Arc (Jeanne d’Arc), and so at the time it was written France & England were enemies…. "I find that learning shall be at a great loss.."
Until seven in rank have held the Hierarchy"
Until severn Pontificates have passed." "Then shall there be against the Church a greater persecution than ever was and thereupon such great epidemics shall develop that more than two thirds of the world shall perish, so much so that no one shall know the owners of the fields and houses, and grass shall grow in the streets knee high and even more." 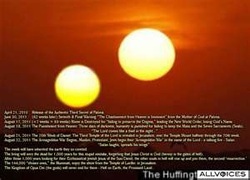 "For seven days the great star shall be seen.."As if two suns in the sky shall appear. The big mastiff shall be howling all night, when the Pontiff shall go into exile"
"..during the time the hairy comet shall appear..struck from heaven, shaky peace, shaking earth..."